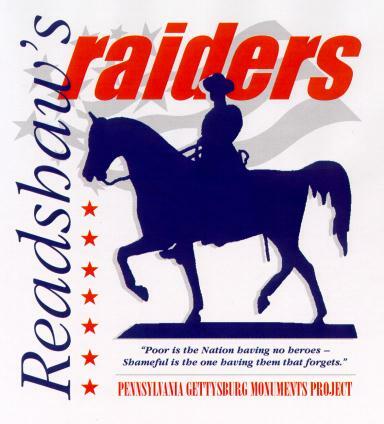 A great new way to support the Pennsylvania Gettysburg Monuments Project has just been unveiled in the form of tee shirts that sport the new "Readshaw's Raiders" logo. This popular nickname for the people who have supported Rep. Harry Readshaw's efforts to save the Icons of Freedom, those monuments and markers on the Gettysburg Battlefield memorializing the soldiers of Pennsylvania who fought there, is now emblazoned on stylish white pre-shrunk tee shirts. The cost is only $20 each (plus $2 postage per shirt), and all proceeds benefit the Pennsylvania Gettysburg Monument Project. Sweat shirts are also available (only large and extra-large sizes), at a cost of only $30 each (plus $3 postage per sweat shirt). If several shirts are ordered together, special pricing for the order will be given as they can be shipped priority mail for less money. Contact the project coordinators for details on postage for multiple shirt orders. Room 122 South Office Bldg. Make the check payable to "GBPA Race." Send a check in the amount of $33.00 ($30 per shirt and $3 postage) to the same address above. Make the check payable to "GBPA Race." Email or contact Rep. Readshaw's office to see what postage will be for a multiple shirt order. Don't forget to include your full name and street address for delivery. If you include your email or telephone number, we can contact you in the event of a problem or delay. Shirts will be shipped the same day your order is received. Readshaw and the Pennsylvania Gettysburg Monuments Project may be contacted by e-mail at gettysburg@pahouse.net or by phone, 717-783-0411. This page is best viewed with Internet Explorer.